We wanted to make you aware of a Basketball Fundamentals Camp that has been developed by basketball players, coaches and parents of girls who have played basketball at Monticello. A fundamentals camp that will provide an opportunity for the girls to really begin to work on specific skills needed as they move to the next level such as: proper shooting form and footwork, free throw consistency, dribbling techniques, ball control, passing precision, one on one skills, and offensive moves based on their strengths and positions, etc. These camps would be held on Saturday mornings starting March 16 and going into early April. This camp will be provided at a cost of just $10 per participant. Scholarships are available by contacting Craig. 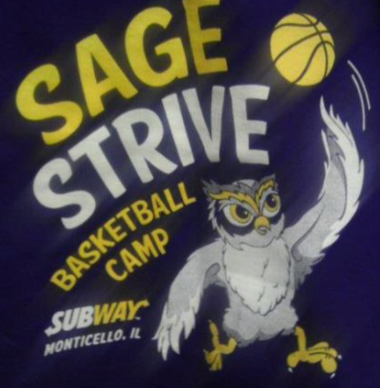 We also plan to have some older Sage players come to demonstrate and work with the girls at the camp. Girls dedicated to improvement should expect to work hard, improve their skills and see signs of change by the end of our sessions. Our hope is that they will take these positive changes and work on them over the summer and before next year's season starts. If your daughter is interested in attending this camp, I would ask that you complete the attached form, take a picture of it and send it to either the phone number or email listed below for Craig Myers.